Wensleydale is known for its beauty and made famous by its cheese and Wallace and Gromit! It's name after the pretty village of Wensley which used to be a larger market town. 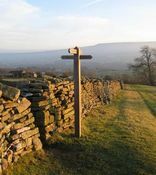 Wensleydale’s best-known market towns and villages are Hawes, Leyburn, Bainbridge and Aysgarth. England’s shortest river, the Bain, links Semer Water to the River Ure at Bainbridge. Nearby are several beautiful waterfalls: Hardraw Force, Aysgarth Falls, Whitfield Gill Force and West Burton. Hawes is where you'll find excellent cafes, shops to wander around and of course Wensleydale Creamery where you can see Wensleydale cheese being made. You can also see how rope is made at Outhwaites, almost next door to the Dales Countryside Museum. The Dales Countryside Museum is a great starting point for any trip to the Dales, giving an insight into the area's history, traditions and life of farmers and former lead miners. Middleham was once home to Richard III and Middleham Castle and regarded as the 'Windsor of the North'. It’s now known for its racehorses: you can often see them training on the gallops in the morning. Visitors can give their car a rest and enjoy a journey on the Wensleydale Railway which runs from Leeming Bar, to Redmire, near Castle Bolton. Bolton Castle in the contrarily named village of Castle Bolton is a fantastic vantage point from which to admire the Wensleydale countryside. Children love playing hide and seek at Jervaulx Abbey. Despite its popularity, it is still easy to find very tranquil places to rest and admire the scenery, such as on the Buttertubs Pass and in the villages strung along Coverdale, a branch off Wensleydale. In a place where much of the wealth was originally built on wool, it’s not surprising the dale has its own breed of sheep: the Wensleydale with a fleece that looks like silky ringlets. Leyburn draws visitors to its market place with an array of quirky independent shops and farmers come to exchange their news and beasts at the Auction Mart. Campbell’s grocery store sells an amazing selection of excellent local food, perfect for a picnic on the nearby Shawl.